"Vinoy stories have become so legendary that even some skeptics have started to scratch their heads." In the year of 1925, a man by the name of Aymer Vinoy Laughner, elected to start construction on the Vinoy Hotel. The story surrounding this decision has been passed from one individual to another for nearly nine decades. Aymer Vinoy Laughner was the son of a man that many have described as being an “Oil Baron” and had a knack for being highly intelligent in finance and business. One night, Aymer elected to indulge in some fun with some friends and other individuals that were considered to be highly notable of the time at his home, which was located in St. Petersburg, Florida. One individual present at the event was a golf celebrity of the era named Walter Hagan. In addition to this, a famous developer in the real estate market named Gene Elliot was present. Aymer made a small bet with the real estate developer. He would provide Walter Hagan with his pocket watch. The celebrated golfer would have to conduct three perfect drives of golf balls off of the face of the watch. If he managed to do so without causing any type of damage, he committed that he would purchase the piece of property across from his home, which consisted of twelve acres, and create a magnificent resort on the property. At the time, Gene Elliot held the deed to the property and was in the position that he could make the wager. Naturally, Walter Hagan successfully hit the golf balls from the watch and did not damage the beautiful time piece. Immediately thereafter, the gentlemen took a brown paper bag and wrote out the contract that stated that Laughner would be purchasing the property. On the fifth day of February in the year of 1925, the construction of the haunted Florida Renaissance Vinoy Resort in St. Petersburg started. It only took a total of ten months for the efforts to be completed. 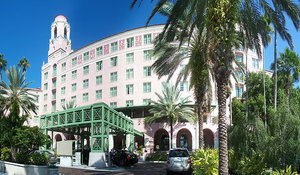 Initially, the Vinoy Hotel was established to service the public from December of each year to March of the following year. It was appropriately dubbed a “Seasonal Hotel”. At its opening, individuals would pay approximately twenty dollars for each night that they resided at the establishment. While this seems quite low in today’s world, it was considered to be one of the most expensive rates at its time. Many celebrities have visited the Vinoy Hotel throughout history. In addition to the notable names we have already mentioned, Herbert Hoover and James Stewart also resided at the establishment. While Aymer Vinoy Laughner experienced a lot of success with the establishment, he sold the structure to a man by the name of Charles Alberding immediately after World War II. During the war, the United States Army had to take over the establishment for training purposes. When it was finally sold, it cost a total of seven hundred thousand dollars. Immediately after the purchase, Charles Alberding experienced a lot of financial success for approximately twenty years. Unfortunately, the establishment had to close its doors to the public in the year of 1974. When this happened, most of the items contained in the Vinoy Hotel were sold. Because of the fact that it stood, abandoned, in a large Florida city, many vagrants started to break in and lodge at the structure. In the early part of the 1990s, two corporations merged and developed a partnership and purchased the Vinoy Hotel. The first corporation was the “Vinoy Development Corporation” and the second was the “Renaissance Hotels and Resorts” company. An investment of ninety three million dollars was placed in the hotel for renovation purposes and reopened. Today, it is considered to be a “Four-Diamond” hotel. •	The right-handed relief pitcher associated with the organization known as the “Florida Marlins” named Scott Ryan Williamson has experienced paranormal activity in the Renaissance Vinoy Resort in St. Petersburg. The experience came during the year 2003 when he was playing for the Cincinnati Reds. First, he noticed a very faint like light emerging from the area where the pool is located when he turned out the lights in his room. He then got the immediate feeling that he was being observed. He tried to dismiss the experience and rolled over, stomach down, to get some sleep. It was then that he felt immediate pressure on his back and experienced complications breathing. He turned over and experienced relief. When he rolled back onto his stomach, the same event transpired. He is quoted in saying “It felt like someone was sitting on me…” He turned back over and observed a man standing in a coat near the curtains. •	Immediately after Williamson experienced this, the Pittsburgh Pirates checked in to the haunted Florida establishment. The strength coordinator and the individual that coordinated pitching, Frank Velasquez, had an experience of his own. It occurred at approximately five in the morning. Frank awoke and witnessed a transparent male standing in the region near the desk in the room. In speaking of his experience, he shrugs it off and stated “We were so travel disoriented and it was so late, you can’t do anything but just close your eyes”. •	Many individuals have observed a distinguished male walking in the halls, dressed in a formal suit. Most immediately got the impression that he was with the haunted Florida hotel as a concierge. However, when looking back to him or attempting to draw his attention, they discover that he has completely disappeared into thin air. •	One day, a man who once served as a reliever for the team known as the “Toronto Blue Jays” talked his wife into staying at the Vinoy Hotel instead of traveling back and forth to the region from Brooksville, Florida. His wife, Kandria, objected. She had heard the rumors of the paranormal activity and was not at all comfortable with the situation. Eventually, she agreed to lodge at the establishment with their children. However, while he was at practice to optimize his bating skills, he received a call from his significant other. She explained that she and the children had witnessed water turning on and off, and the toilet flushing continuously and she absolutely refused to spend any more time at the location. The section of the hotel that they were staying in was referred to as the “Old Wing” and the employees there confirmed that those types of situations were common in that section. •	Many individuals have experienced flickering lights in their rooms at night, as well as unexplained noises such as the sounds of walking, shuffling and chains. •	When Ghost Hunters visited the location, several unexplained events occurred in the room that Jason Hawes elected to stay in. First, the closet door was opened by a falling ironing board. When tested, it was established that a great deal of force was needed to make the board hit the door hard enough to open it due to the magnets on the closet door. In addition to this, he heard two separate voices while resting in the room. Once the investigation was wrapped up, the team agreed that something appeared to be in the structure, but that it was not at all threatening. If you are interested in haunted Florida locations, you should consider booking your reservations at the Renaissance Vinoy Resort in St. Petersburg. This is especially true if you are interested in conducting an overnight ghost hunting investigation. Many notable individuals in sports have experienced paranormal activity at the establishment and you may experience this as well. The Vinoy Hotel is located at 501 5th Avenue Northeast in St. Petersburg, Florida. In addition to exciting events that surround the paranormal, you will find that the Vinoy Hotel has a beautiful golf course, a private Marina for those who enjoy the water, a beautifully designed spa and an amazing variety of tennis courts. Furthermore, it is located just a short distance from the beautiful beaches on the Gulf Coast. Check for the lowest price, get directions, view photos, and read the reviews and traveler tips for the Renaissance Vinoy Resort and Golf Club.